The solicitations for Supurbia would lead you to believe this book will be a combination of the Justice League and The Real Housewives of Astro City. 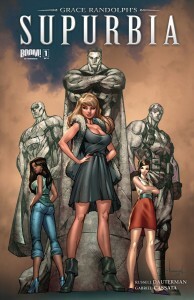 After reading it, it’s far more accurate to say it’s JLA meets ABC’s GCB, which is a good thing. Based on the introductions of the principal characters, it’s clear we’re going to see more about the spouses of the featured super heroes in this series which makes for an interesting take on the genre even at a time when we’ve seen just about every examination of the caped set imaginable. Spoilers for BOOM! Studios’ Supurbia #1 will follow. PTB: While the spouses of the Meta Legion are clearly meant to the be the stars of this book, writer Grace Randolph provides a solid introduction to the Legion itself. The team is composed primarily of analogs of DC mainstays in Sovereign (Superman), Batu (Wonder Woman), the Cosmic Champion (Green Lantern), Nite Fox (Batman) and Agent Twilight (Robin), but also represented here are an aging Captain America in Marine Omega and his partner Bulldog (Bucky). All of them have their dirty laundry on display in the first issue. KevinMLD: I think it just needs to be said that there’s just nothing clever or novel in 2012 about having a Batman and Robin analogue turn out to be gay. It’s like a stand up comic telling airplane jokes. It’s been run into the ground. The Ambiguously Gay Duo being the prime example. PTB: I found the computer message reading “invalid entries” when they were caught in an intimate moment to be far more egregious than presenting a gay Batman and Robin. I have to admit that while the cast closely resembles mainstream heroes, they have a certain Watchmen-inspired quality about them as well. This is particularly noticeable in the case of Sovereign. KevinMLD: With Sovereign, we definitely get an unnerving take on a Superman that has lost touch with humanity. There are really clear comparisons that can be drawn between Sovereign and Dr. Manhattan. PTB: Supurbia focuses on the scandalous lives of the meta human elite, but it’s not just the stuff of tabloids. A more conventional conflict is looming on the horizon by the end of issue #1. KevinMLD: It’s an interesting twist to have an entire team of superheroes living on the same street by design as a way of protecting their secret identities. It makes a certain amount of sense. PTB: That’s one take on it, but it could also put all of them and their families in jeopardy and I’m sure that will be explored. Each of these heroes has a spouse or significant other (or both) that gets a formal introduction and they’re clearly meant to take center stage in this series. KevinMLD: Personally, I found the Wonder Woman stand-in, Batu, and her family the most interesting of the bunch. There is a lot going on in both her and her husband’s relationships with their children. PTB: Their scenes stole the show for me. It’s a large cast to introduce in twenty-four pages, but thankfully each of the characters is visually distinct. The book looks good and the character designs are a big part of that. Russell Dauterman’s a style is not something I’m able to readily compare with anyone in particular, though there are similar elements to both Chris Bachalo and Ed McGuinness. It works for the story and has a certain familiarity. KevinMLD: I thought the writer did a particularly nice job of establishing the personalities of many different characters in a single issue. My biggest issues were that the art, including the colors, felt weird to me. I can’t decide if it just didn’t feel quite professional level or if they were deliberately going for a different look and feel than most other modern comics. The colors were so bright and especially once they reached the party scene the backgrounds become almost non-existent. It just didn’t quite sit right with me. The art is definitely more cartoony in feel than most artists you’d see on a Marvel or a DC book, but I almost feel like it doesn’t go far enough in that direction to actually feel like a unique vision. It’s walking a weird tightrope. I think if the artist went just a little crazier, he could evolve into something special. I feel like there’s real potential there, it just hasn’t been realized yet. PTB: I certainly liked the first look into the world of Supurbia. It’s more akin to something you’d find on Angelique’s DVR schedule than my typical pull list, but there’s indications this could be a fun four issues. I think this is a book that could definitely find an audience and it’s worth taking a look. Unfortunately, it may be a tough book to find a physical copy of as two of the three local stores I contacted about it hadn’t ordered any copies. KevinMLD: I enjoyed the first issue overall. I think there are interesting places for the story to go. For example, it would be funny and appropriate if half way through the series they retconned away all of the marriages through a deal with the Devil or a purple hooded woman. BOOM! Studios Supurbia #1 is available today wherever comic books are sold. BOOM! Studios Blog » Blog Archive » It’s a SUPURBIA extravaganza! !